Some photographers who currently shoot DX are interested in the Nikon D600 but are wary of the cost of replacing all their DX lenses with FX equivalents right away. Fortunately, like other Nikon full frame cameras, the D600 can use DX lenses, but the image will be cropped to a DX size (with a resolution of 3936x2924 instead of 6016x4016). One issue is how the DX-cropped D600 would perform against a DX camera such as a Nikon D90 with respect to high ISO performance. That's the subject of this post. I took a test scene that had a mannequin head, fine print text, and textured details of white, black, red, green and blue objects. I used a Nikkor 24-70 2.8G at 50mm and used an aperture of f/8, with the focus on the text. To minimize any discrepancies due to focusing error, I focused in live view. For consistency of light levels I used flash. 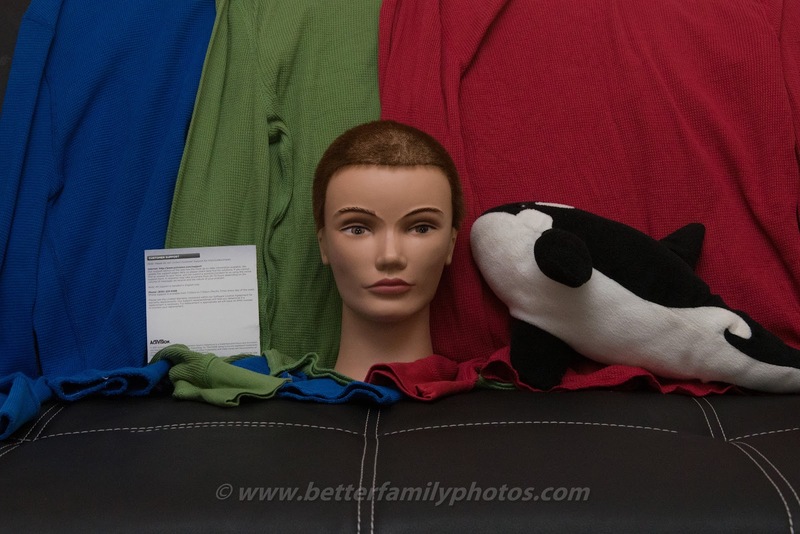 I compared 1600 ISO to 6400 ISO. In addition I tried a simulated comparison at 12800 ISO. The D90 only goes as high as 6400 ISO in camera. To simulate 12800 ISO, I underexposed the 6400 ISO by one stop (by reducing the flash to -1 FEC) then adding 1 stop in postprocessing. For the D600 I took the shot in raw. For the Nikon D90, I also took the shot in raw but because the D90 has a 12mp resolution compared to the D600's 10mp DX crop resolution, I resized the 12mp image (in raw) down to the same 10mp resolution as the DX-cropped D600, then saved as a TIF. The files were all imported in Lightroom with default sharpening and no noise reduction. Here is a link to the album where you can download the full resolution photos. To see the full resolution you need to click on the zoom (magnifying glass) icon, or better yet, download the images. 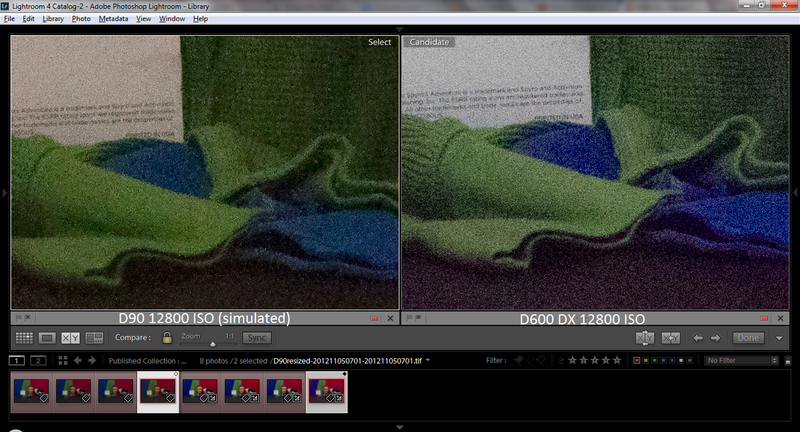 At the ISOs I tested, the D600 consistently appeared more detailed, although it also had more luminance noise. Here is a screenshot of a 1:1 comparison of the 1600 ISO samples. You can see that the texture on the cuff of the green shirt is much more detailed in the D600 sample. Here are the 3200 ISO samples. And here are the 6400 ISO samples. Here are the 12800 ISO samples (in the case of the D90, it is simulated only). Both have lost fine details but the text appears clearer to me with the D600 sample. From these samples, I conclude that there would be no disadvantage to using the D600 with a DX lens even if cropped, compared to a Nikon D90. It would be interesting to see a similar comparison with a D7000 (I suspect the D7000 may come out ahead). 11/7/12 UPDATE: web album now includes unresized D90 shots. They do look better than their resized versions and I think they are equal to if not slightly better than the DX-cropped D600 shots. 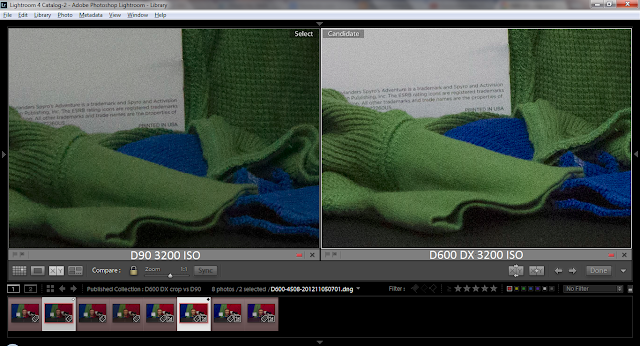 Overall I would still say that using DX lenses on a D600 is feasible. Thanks again to Opt for the suggestion. Btw if you want to compare portions of the image that are on more similar focal planes check out the fabric around (not below) the text. Good test. One question though, you mention the full frame size of the D600 as 5834x3894 pixels. My D600 produces files with 6016 x 4016 in Lightroom as .DNG converted from RAW. I wonder why the difference? Thanks John. You're absolutely right about the D600's full resolution, now that I think about it. I wonder why the image I looked at had that particular resolution... Hmmm. Maybe I forgot that I straightened it, resulting in a slight crop. I will correct the text. Thank you very much! Mic, thanks for the helpful comparison! The straightening that you mention in the above comment can also affect things. Also, are you sure you're not looking at out-of-focus images? At 2m 50mm f/8, a few cm of front-focus (i.e., focusing on the paper instead of sleeve) are enough to make the blur circle bigger than a pixel. So a flatter target would give a clearer indication. Hi Opt. That's a good point. I will post the unresized D90 shots as well when I get home. I didn't straighten any of the images here (what I recall was that I was looking at the photo for another D600 image, which may have been straightened). As for being out-of-focus, I suppose that is a possibility even though I focused in live view. If I have time to do a re-shoot in the future, perhaps, but to be honest it's not really a high priority for me.